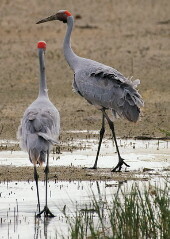 Choose any Ozcranes page from our four Sections: Info, Brolga & Sarus Crane, Conservation and Research. 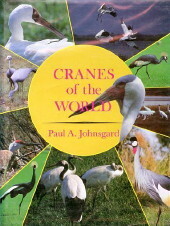 Articles and downloads are provided by kind permission of authors and/or publishers as appropriate. The "Travelling Logo" (top left of screen) takes you back to Ozcranes Home page from anywhere within the site. 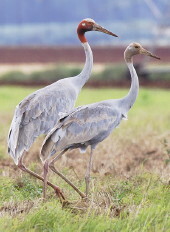 ↑ Inka Veltheim banding Brolgas in southern Australia (Inka Veltheim). ↑ Crane-friendly fencing logo designed for Ozcranes by Ron Hill.